The alliance in Uttar Pradesh is realisation of the dream of Lalu Prasad for defeating communal forces, Tejashwi Yadav said. LUCKNOW: RJD leader Tejashwi Yadav has met BSP supremo Mayawati here after the announcement of a pre-poll alliance between her party and the SP in Uttar Pradesh for the Lok Sabha polls this year. The Rashtriya Janata Dal leader arrived in the state capital Sunday night and met the Bahujan Samaj Party chief, during which the two leaders exchanged greetings, RJD sources said Monday. The Leader of opposition in Bihar Assembly hoped that the alliance formed for Uttar Pradesh will be extended to his state and all parties will work together to defeat the BJP, sources said. They said despite the alliance being announced in Uttar Pradesh, parties like the RJD could be accommodated on isolated seats on the lines of Kairana, where Tabassum Hasan won on RLD ticket in a Lok Sabha bye-election though she had close links with the Samajwadi Party. In return, the RJD, which is an ally of the Congress in Bihar, could accommodate some candidates of the BSP and the Samajwadi Party in the state, sources said. Extended warm Birthday greetings in advance to the person who deserves honor because of everything she has achieved in life. Tejashwi Yadav told reporters, "I am the youngest. I have come to wish her (Mayawati) on her birthday in advance and take blessings. She is a mature leader and we should keep getting her guidance in future." 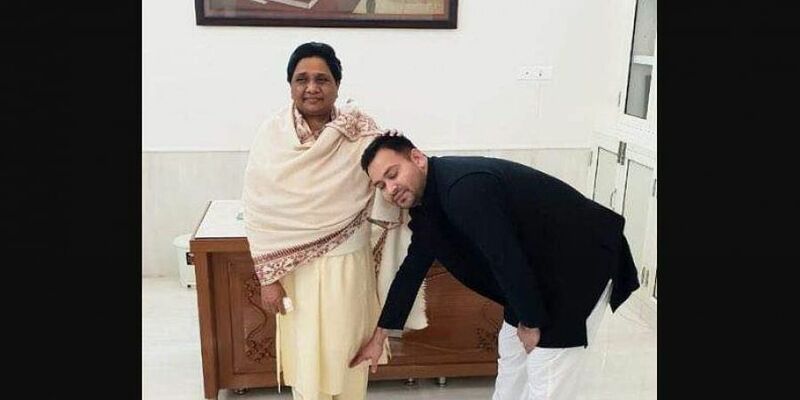 Later, he shared his pictures with Mayawati on social media, in which he is seen touching the feet of the BSP supremo. The alliance in Uttar Pradesh is realisation of the dream of Lalu Prasad for defeating communal forces, Tejashwi Yadav said, adding that the alliance will help whitewash the saffron party from both Uttar Pradesh and Bihar. Once arch-rivals, the Samajwadi Party and the BSP announced Saturday their tie-up in Uttar Pradesh for the 2019 Lok Sabha polls, sharing 38 seats each and keeping the Congress out of the alliance. They also left two seats out of the 80 in the state for smaller allies, without naming them. But there have been talks with Ajit Singh's Rashtriya Lok Dal (RLD).